Have you become unhappy with your kitchen’s interior design lately? Whether you want to update the look of your kitchen or you find your cooking spaces just are not as functional as you would hope they would be, we are here to help. At Abode Building Center, our kitchen remodelers know that many of our clients’ kitchens are more than just places to prepare meals. Instead, they are often a place of socialization among family members and close friends. Our skilled designers and builders have many years of experience in helping homeowners create their dream kitchen space. There are many benefits to furnishing your kitchen with the latest kitchen cabinet designs. Below are four reasons you may want to take advantage of our new cabinet and design services. High-quality cabinets are usually built to last up to 50 years. However, if you are living in an older house, your cabinets’ natural lifespan may be running out. If you find yourself doing many repairs on your kitchen cabinets just to make them functional, it may be time to consider cabinet replacement. While kitchen cabinet resurfacing can be a viable option, often homeowners save money in the long-run by just replacing their aging cabinets. At Abode Building Center, we can help you find a new cabinet style that fits your design preferences, and your life. If your kitchen cabinets are not opening or closing properly, it may be time to replace your cabinets. Sometimes, minor cabinet issues can be resolved by a handyman. However, if these issues are continuous, it may be time to consider a complete cabinet replacement. Also, be sure to consider the functionality of your kitchen cabinets. Today, there are many space-saving solutions applicable to cabinets that can free up much-needed counter space. A dated kitchen can make it difficult to sell your home on the housing market. Whether you’re looking for the latest kitchen designs, or you are interested in something more timeless, Abode Building Center is your best option for kitchen cabinetry installation. Our cabinet designers can work with you to select a more modern style that can help your home stand out among the competition. Choose from our selection of cabinets and handles for a customized look. Kitchen design is so important, especially if your home has an open floor plan. In order to preserve the design continuity of your home, be sure to select kitchen cabinets that reflect your home’s unique style. For example, lighter hued woods can make your kitchen feel more airy and spacious. At Abode Building Center, we offer a wide selection of kitchen cabinets for you to choose from, giving you the opportunity to customize your home according to your design preferences. If you are interested in hearing more about how our Portage MI kitchen cabinet installation services can improve the look of your kitchen space, please feel free to call our kitchen remodelers (269) 329-1800. 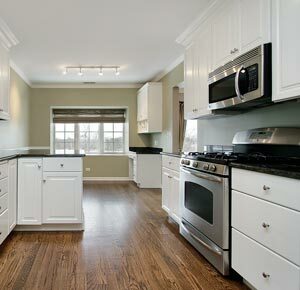 At Abode Building Center, our kitchen cabinet contractors take pride in helping homeowners reclaim their kitchens.